General announcements and forum rules. I have just downloaded Inkscape from the oficial page but it appears in an unknown language which I am unable to understand. How can I make to make it work in English or Spanish ?? But since you can't read it, I'll give you some landmark directions. Please click the 2nd icon from the right on the Command bar (which is the first row of icons beneath the menu bar). The scroll down to the 4th item from the bottom, in the list that's on the left side of that window, and click. The first item at the top of the next window is Language. It will have a very long dropdown menu. From that, choose your language. Then restart. 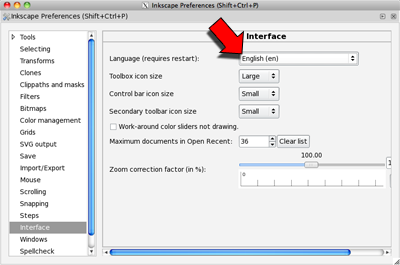 Inkscape should use the systems default language settings (so it displays the same language at start-up as the computer). Use the short-cut shift+ctrl+P to open the preferences.